The Peterborough Energy-from-Waste (EfW) Plant started operations in January 2016. Image: courtesy of Viridor. The new facility will treat 85,000t of residual waste a year to generate 7.25MW of energy. Image: courtesy of Viridor. The plant integrates Babcock & Wilcox Vølund’s proprietary DynaGrate water-cooled combustion grate. Image: courtesy of Babcock & Wilcox Vølund. The BREEAM-certified building is approximately 35m-high, with its chimney stack rising to a total height of approximately 60m. Image: courtesy of Babcock & Wilcox Vølund. 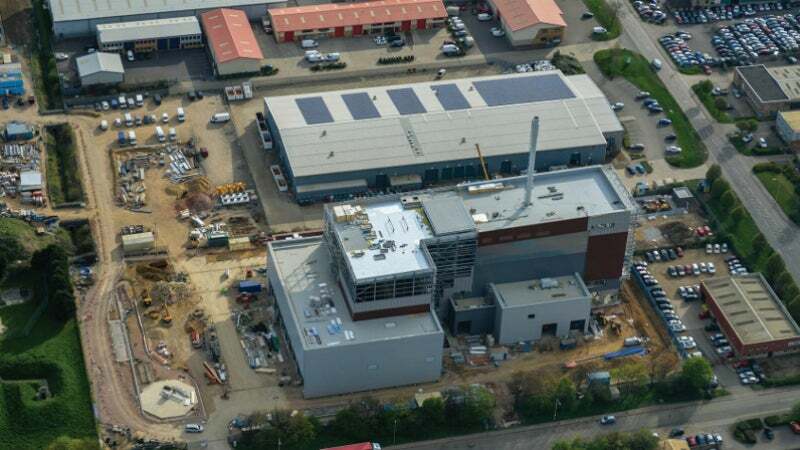 The Peterborough Energy-from-Waste (EfW) facility is located at Fengate, within the Eastern Industrial Estate, approximately 2.5km south-east of Peterborough and adjacent to the Peterborough power station. The energy recovery facility became operational in January 2016. It is capable of handling 85,000t of residual waste a year to generate 7.25MW of energy, which is sufficient to power 15,000 households. The facility was developed and is being operated by Viridor, a subsidiary of Pennon Group, as part of a 30-year public private partnership (PPP) deal, signed in February 2013, to treat the Peterborough City’s residual waste. Site preparation works for the construction of the facility commenced in June 2013 and the ground was broken officially in October 2013. The project generated approximately 250 jobs during the construction phase and 28 people have now been hired for the operations. In addition to generating electricity and diverting 94% of the city’s waste from landfill, the EfW plant will also enable the city to offset approximately 10,000t a year of carbon dioxide emissions. The EfW plant is housed in a Building Research Establishment Environmental Assessment Methodology (BREEAM)-certified building that is equipped with offices and welfare facilities for staff, and an education centre. The building is approximately 35m-high, with its chimney stack rising to a height of approximately 60m. The project also involved the preparation of site roads, excavation of an 8m-deep waste bunker and construction of weighbridges. The EfW process starts with the conveyance of municipal waste to the waste bunker, which integrates a crushing facility. The crushed waste is transferred to a furnace to undergo the combustion process. The heat generated from the combustion process is then used to heat water in a boiler, the generated steam from which is further used to drive a turbine-generator to produce electricity. The resulting gases from the combustion process are cleaned prior to being emitted through the chimney stack, the residues from the gas cleaning process including fly ash are either recycled or sent to landfill, while the bottom ash from the furnace is cooled and the ferrous metal recovered for recycling. "The EfW plant will also enable the city to offset approximately 10,000t a year of carbon dioxide emissions." The Peterborough EfW facility operates using the proprietary NextBAT technology developed by Babcock & Wilcox Vølund in collaboration with its subsidiary Götaverken Miljö. The technology provides a complete solution to convert waste into energy, complying with the European Best Available Techniques (BAT) Reference Document BREF requirements. It integrates the company’s proprietary DynaGrate water-cooled combustion grate, the proprietary Inconel corrosion protection system for the boiler’s side walls and pipes, the proprietary Volumix over fire air system, advanced combustion control system (ACC) and computational fluid dynamics (CFD) simulation for designing. The technology further integrates the company’s proprietary CUTNOX technology for the reduction of NOx emissions, Sulphur recirculation technology for decreasing the corrosion rate of the super heaters, proprietary ADIOX technology for absorbing dioxin, proprietary MERCOX technology for the removal of mercury and scrubber-integrated type of wet electrostatic precipitator (WESP) to reduce emissions of hazardous ultrafine particles and aerosols. The engineering, procurement and construction (EPC) contractor for the project was the consortium of Babcock & Wilcox Vølund and Interserve Construction. The technology and associated facilities were supplied by Babcock & Wilcox Vølund, the flue gas treatment system was supplied by Götaverken Miljö, and the construction works were performed entirely by Interserve Construction. Hamilton Leicester assisted Interserve Construction in the project. Atkins Global served as the environmental permitting consultant to the Peterborough City Council and further provided management services during the construction phase. Mace was also involved in helping the city council meet the project’s environmental targets. The architect for the building was Studio E LLP. The installation contract for the building’s cladding was awarded to KGM Roofing, who further subcontracted Fatra to supply the membrane flat roofing system, EuroClad Elite for the wall cladding systems, Booth Muirie for the rainscreen system and Rodeca to supply 1,200m² of its proprietary PC3550-10 Rodeca poly-carbonate cladding panels. MLM served as the structural engineer for the building and further subcontracted BHP Design to create the building information modelling (BIM) using its proprietary Revit software. Other key players involved with the development of the building include RPS and GSDA. The project involved an investment of £75m, which was fully financed by the Peterborough City Council through reserves generated from savings and prudential borrowing from the Public Loans Board. Pinsent Masons advised Peterborough City Council for the prudential borrowing, whereas the financial model auditing services and a full tax and accounting review on behalf of the sponsors was conducted by Operis. Röhsler & Co was established in 1928 and provides a range of specialised services in power plants and airports around the world, with a particular prominence in Austria. We have an experienced team of employees with engineering training in sectors that include chemistry, construction and mechanics.